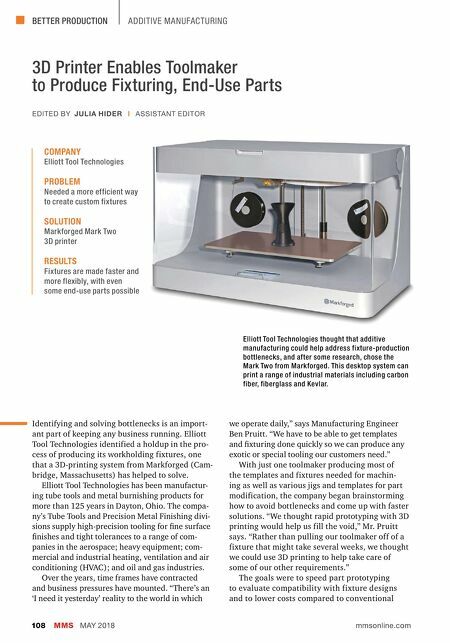 BETTER PRODUCTION MMS MAY 2018 108 mmsonline.com ADDITIVE MANUFACTURING 3D Printer Enables Toolmaker to Produce Fixturing, End-Use Parts Identifying and solving bottlenecks is an import- ant part of keeping any business running. Elliott Tool Technologies identified a holdup in the pro- cess of producing its workholding fixtures, one that a 3D-printing system from Markforged (Cam- bridge, Massachusetts) has helped to solve. 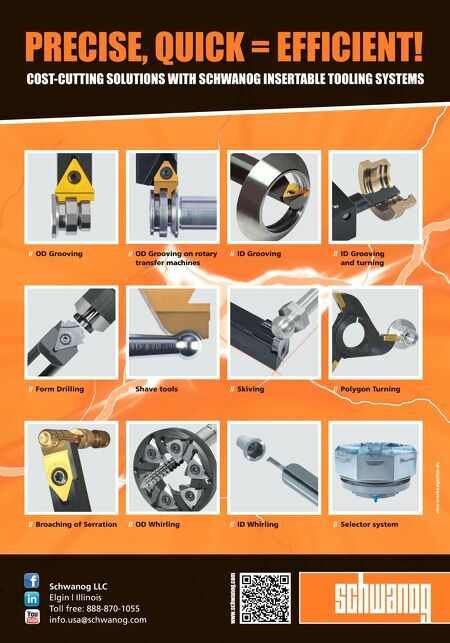 Elliott Tool Technologies has been manufactur- ing tube tools and metal burnishing products for more than 125 years in Dayton, Ohio. The compa- ny's Tube Tools and Precision Metal Finishing divi- sions supply high-precision tooling for fine surface finishes and tight tolerances to a range of com- panies in the aerospace; heavy equipment; com- mercial and industrial heating, ventilation and air conditioning (HVAC); and oil and gas industries. Over the years, time frames have contracted and business pressures have mounted. "There's an 'I need it yesterday' reality to the world in which COMPANY Elliott Tool Technologies PROBLEM Needed a more efficient way to create custom fixtures SOLUTION Markforged Mark Two 3D printer RESULTS Fixtures are made faster and more flexibly, with even some end-use parts possible EDITED BY JULIA HIDER | ASSISTANT EDITOR we operate daily," says Manufacturing Engineer Ben Pruitt. "We have to be able to get templates and fixturing done quickly so we can produce any exotic or special tooling our customers need." With just one toolmaker producing most of the templates and fixtures needed for machin- ing as well as various jigs and templates for part modification, the company began brainstorming how to avoid bottlenecks and come up with faster solutions. "We thought rapid prototyping with 3D printing would help us fill the void," Mr. Pruitt says. "Rather than pulling our toolmaker off of a fixture that might take several weeks, we thought we could use 3D printing to help take care of some of our other requirements." The goals were to speed part prototyping to evaluate compatibility with fixture designs and to lower costs compared to conventional Elliott Tool Technologies thought that additive manufacturing could help address fixture-production bottlenecks, and after some research, chose the Mark Two from Markforged. This desktop system can print a range of industrial materials including carbon fiber, fiberglass and Kevlar.